Among continents, North America is home to the world’s greatest number of different kinds of salamanders, roughly 190 species, of which 19 are present in Canada. Now, a newly-discovered disease-causing fungus has put these species at risk of severe population declines or even extinction. The fungus has a long name but a short history in scientific understanding. 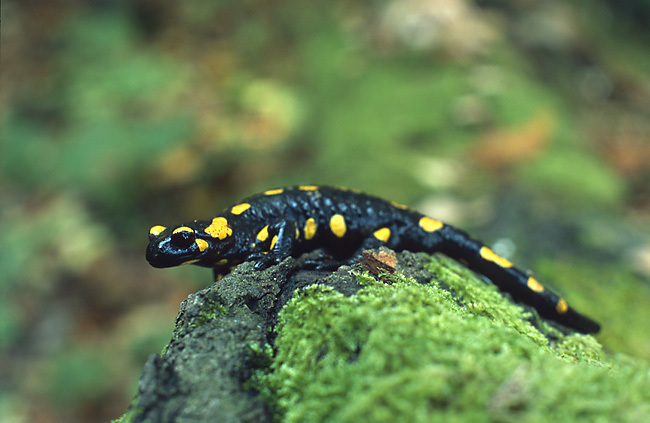 Batrachochytrium salamandrivorans was only identified by scientists in 2013 after it was discovered to be the cause of fatal disease in a small population of the European Fire Salamander (Salamandra salamandra) in the Netherlands that occurred starting in 2010. The discovery of this fungus has caused global conservation alarm because another related fungus, B. dendrobatidis, has been spread around the world through commercial trade in amphibians and has caused the extinction of 200 or more species of tropical frogs. The scientists who discovered the salamander fungus quickly teamed up with colleagues around the world to try to understand where this fungus may have originated and how widely it may have spread. Their findings were published on October 31st of this year in the journal Science [http://www.sciencemag.org/content/346/6209/530]. They tested samples from 5391 amphibians collected on four continents and also experimentally infected a range of representative species amphibian species. They concluded that B. salamandrivorans is from Asia where it has been a parasite of amphibians for perhaps 30 million years. They also conclude that it causes infection and disease only in newts and salamanders and not in other groups of amphibians. This is good news for the other groups perhaps, but very bad news for newts and salamanders. The fungus was transported to Europe quite recently by some means, most likely through commercial trade in Asian salamanders, and appears now to be spreading locally in Fire Salamanders in the Netherlands and Belgium. Experimental infections showed that some North American species suffer fatal infection while others can be infected but tolerate infection and perpetuate the fungus. This means that if the fungus arrives in North America, it likely will be maintained in some species and will devastate many other species. Prohibition of all importations of salamanders into North America is proposed as the only practical way to prevent the fungus from arriving in North America. The CWHC wildlife disease surveillance program has the capacity to detect this fungus should it cause disease in newts and salamanders in Canada, but so few wild amphibians are brought to the CWHC for examination that our capacity to be vigilant for this new disease is severely limited. A. Martel and co-authors. 2014. Recent introduction of a chytrid fungus endangers Western Palearctic salamanders. Science: 346 (issue 6209), pages 630-31, 31 October 2014.